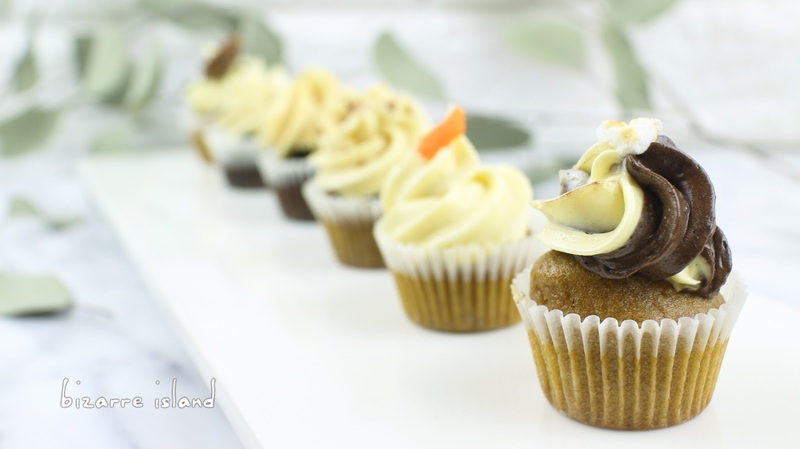 ~ bizarre island ~: NEW 1 Batter 6 Flavours Mini Cupcakes - Brown Sugar Version! Cinnamon roll: Add molasses and a pinch of cinnamon 1 portion, gently mix until combine. Divide the batter over the 4 liners. 16. Let them cool to room temp, pipe on the frosting. Carrot: Beat soften cream cheese until smooth. Add spoonful’s of whipped cream cheese into 1 portion of frosting and beat until incorporate, repeat until all cream cheese is used. Drizzle in maple syrup and beat until incorporated. 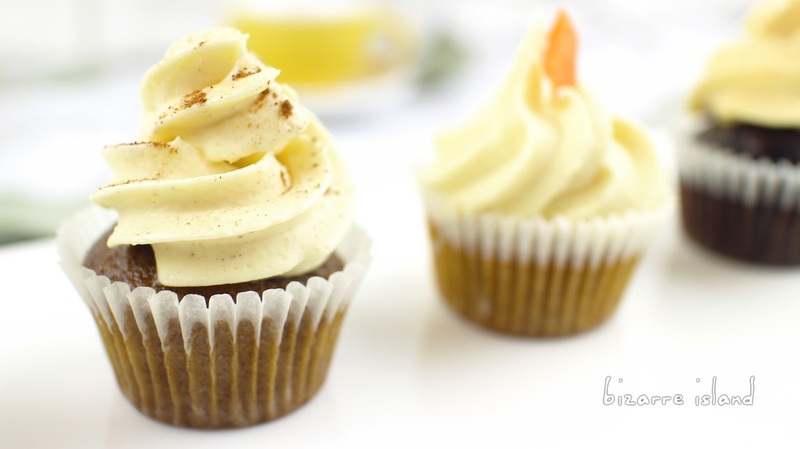 Pipe frosting on carrot cupcakes. Choco chip cookie: Beat soften cream cheese until smooth. Add spoonful’s of whipped cream cheese into 1 portion of frosting and beat until incorporate, repeat until all cream cheese is used. Pipe frosting on chocochip cupcakes. Sprinkle on mini chocolate chips and top with a small cookie. Cinnamon Roll: Beat soften cream cheese until smooth. Add spoonful’s of whipped cream cheese into 1 portion of frosting and beat until incorporate, repeat until all cream cheese is used. Add cinnamon and beat until incorporated. Pipe frosting on cinnamon swirl cupcakes. I. You can mix and match the frosting and cupcake flavours e.g. 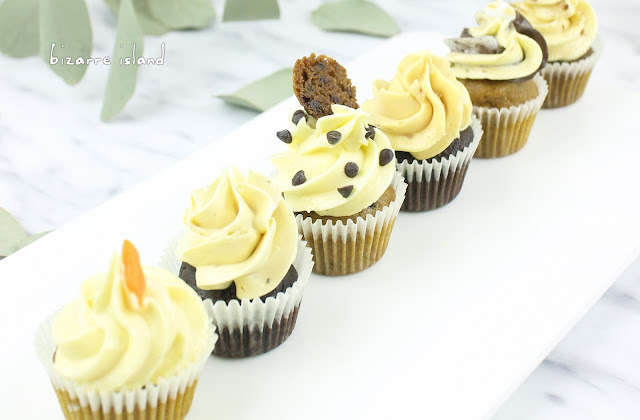 Caramel frosting on mocha cupcakes etc. 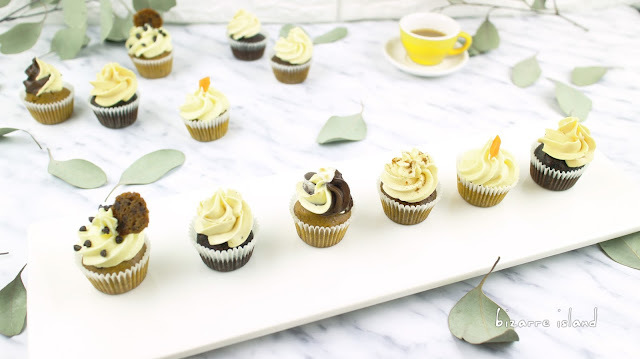 You can even mix and match with our other white sugar cupcake 6 ways. Click here to check it out!